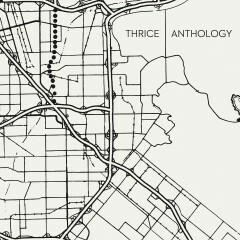 Thrice (who are currently on a hiatus after 13 years and eight full-length releases) have announced details of several pre-order packages for their forthcoming live recording, ‘Anthology’.. The record features 24 songs from their ‘Farewell Tour’ and will be available digitally, on two CDs, and as a limited edition box set containing four LP’s. The LP box set is limited to just 3000 stamped and numbered pieces and will include a 24-page photo booklet along with 2 black LP’s and 2 white LP’s all on 180 gram vinyl. Fans are able to per-order ‘Anthology’ here.